My first year of vegetable gardening didn’t go quite as planned. I had lots of early success, but when it came to the fall harvest, I fell sadly short. I got a handful of tomatoes, but they never got much larger than golf balls. I left them on the vine, hoping they would grow, but most of them shriveled up and died. I saw four small eggplants, and hoped they would keep growing, but I finally harvested them after the frost and tried to roast them, but they were just too small. Good thing I wasn't planning on making carrot cake. The carrots? I waited until the tops were 8 inches tall before excitedly pulling them from the ground… and got a handful scrawny little carrot bites. The beans started off well, but I think I planted them too late, as they like the cooler weather. They wilted and scorched under the July sun. 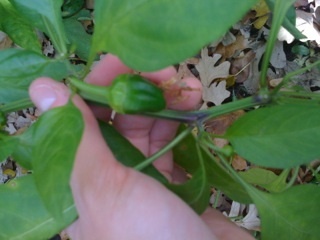 I had several peppers start, and one got a decent size before falling to the ground, where some animal got to it. (Or perhaps the critter knocked it off the vine? 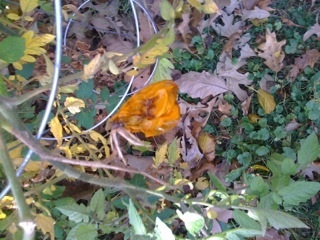 All I know is it was just about ready to pick one day, and on the ground with gnaw marks the next.) But the rest never got very big, despite my waiting. At the end of the season, while removing the last of the tomato cages, I found two decent sized peppers – with gnaw marks. Damn squirrels. The cucumbers and zucchini sprouts did very well on the driveway, but once I transplanted them into the ground, they really didn’t grow much. I had a couple squash blossoms, but no fruit. Meanwhile, the cherry tomatoes and basil in planters along the driveway did very well, and the zinnias, begonias and nasturtiums out front thrived in their full sunlight. So what did I do wrong? Plant too late? Reading labels, it sounds like I should have started these plants earlier, like late April or May, especially the cooler weather veggies like beans. Not enough sun? I watched a couple days, and while the backyard definitely gets far more than the 0 hours of sun it used to, is 4 hours of full sun and another 1-2 of partial sun enough? The tomatoes stretched to reach the sun, but perhaps the lack of solar power stunted their growth. Do I need to do more than just water and weed? Should I fertilize? Mulch? Use Miracle Gro? So, gardening friends – help me out. Alternatively – does anyone have a good local CSA they recommend for next season? This entry was posted in Cooking, Elgin, Yard & Garden and tagged Elgin, Food, Garden. Bookmark the permalink. Wow, our gardens suffered very similar fates. Both my carrots and beets looked good on top but were nothing more than stubs. I had a similar amount of sunlight which I think may be partially to blame. It was my first ever attempt at gardening. I’m hoping that fall crops are not as easy as summer ones. Also, it’s a great time to plant fruit trees as all of the growth is focused on the roots and not the leaves/branches, allowing for maximum root growth for next year. I’m planting some pear trees this weekend! I think next year I’ll actually sit down and plan out when to plant what, rather than the Memorial Day weekend, “Hey, it’s nice out! Let’s buy one of each, dump them in the ground, and see what happens!” method I tried this year. Fruit trees would be nice, but no place to put them. I just removed an overgrown bush/small tree from the side of the house and plan to replace it with smaller bushes that don’t block the windows next spring. My fiance and I planted carrots, pumpkin, and butternut squash. Our carrots didn’t get very big either. The pumpkin never had a chance as the squash took over basically the entire portion of the garden my parents set aside for us. We only ended up with two squash that I pulled on Monday as I knew it was going to get really cold. They’re not completely ripe but close enough. I’m not sure what we’ll do with them as neither of us really eat squash but that’s partly my fault as I just picked whatever and decided to plant it. Great post! I love gardening- it’s what keeps me sane and connected to my mom who passed away last year. My parents always had a big garden and taught me to appreciate the unparalleled taste of homegrown vegetables. This year was the first year of gardening in a raised bed and the tomatoes really took off. I heard a gardening program that extolled the benefits of raised beds- especially for tomatoes- and it proved true for me. I had a much bigger yield than I’ve ever had before and I still have some tomatoes that were green at the end of October that are ripening on my counter. As for CSAs, this past summer I signed up for Angelic Organics and the previous summer used Erewhon Farms. Both were great. I think I’ll use Angelic Organics again next year. They have great customer service (when I asked for more garlic they delivered an extra bag to my home for free) and they provide a great cookbook to all new subscribers.